What Does That Emoji Icon Mean Anyway? If you’re new to Emoji, you’ll be forgiven for not knowing just what some of these icons and characters are supposed to mean. 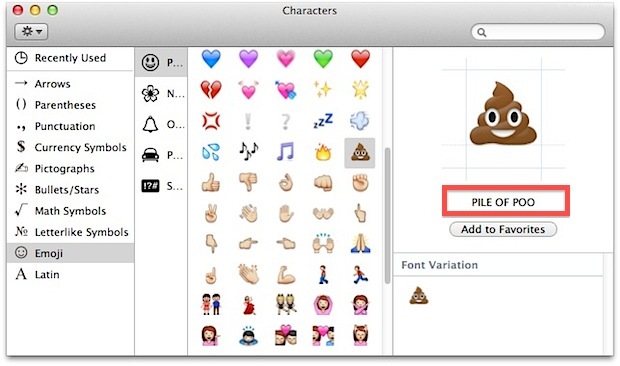 Many are common sense, while others are a bit of a mystery, but there’s an easy way to find out what a specific Emoji character means just by looking at the icon in the Special Character selector of Mac OS X. This panel should be available in just about any Mac app that allows keyboard input, but we’ll use TextEdit as an example. The example above shows the infamous “Pile of Poo”, which also happens to be it’s defined meaning. You can find these little descriptions for any of the Emoji contained in the panel, but because many new Emoji icons are appearing or changing, like the skin tone diversity emoji, not all of them will be available on the Mac emoji keyboard of some versions of Mac OS X and iOS, but that really depends on what version of Mac OS X you’re using. The Speak trick is funny also because Siri will vocalize what the Emoji means, sometimes to hilarious effect, depending on which one you choose to get the meaning of. And yes, the speak trick does work to define Emoji on Mac as well. Or, iOS users may just have to continue taking their best guesses, a smiley face is pretty obvious, as is a heart, but some of the more curious ones out there, who knows, maybe the meaning is found in the intention if not the definition. I find the PILE OF POO to be self explanatory. But what’s the one above PILE OF POO? I’d call it EXTREME FART. How about the next one (the one with three drops)? WET FART? Strange. Why did Apple not add these emojis withe the latest update to OS X? On iOS if you write the emoji, highlight it, and have the accessibility option speak it to you, you’ll get the same result. Good catch on the grammatical error. I love the emojis, BUT why do they disappear when I use them in an email from my laptop or from my iPad in a Face Book message. Actually You can use text to speech on iOS ln any emoji and it will read its meaning. Yes but 8% of computer users use the Mac. And how many of these will use these emoji? 1%? If you enable emojis and speak text on ios it is Dung and the one beside it is Fire so you get Fire Dung or as I like to call it Flaming Poo. 🙄<—<—<— What does this emoji mean ?